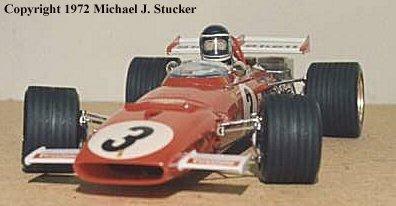 Many years ago (the ’60s & ’70s to be precise), I was a prolific modeler, especially of cars. 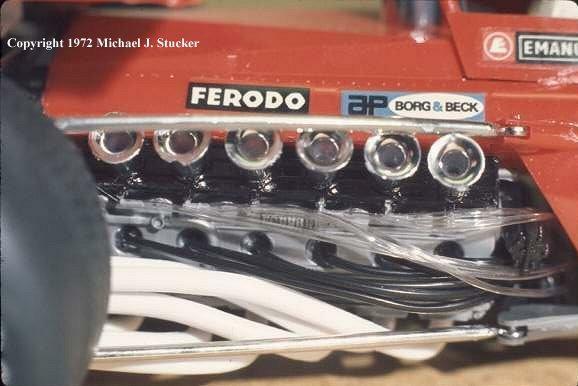 These photos are some of the cars I built back then. Unfortunately, almost all of the models in these pictures are no longer in my possession. 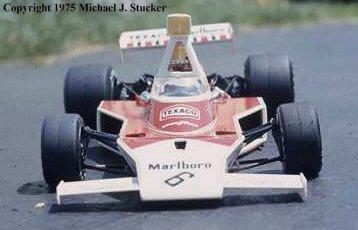 In the picture below, on the top shelf are Tamiya 1/12 kits – Brabham BT44, Yardley McLaren M23, and Texaco/Marlboro McLaren M23. 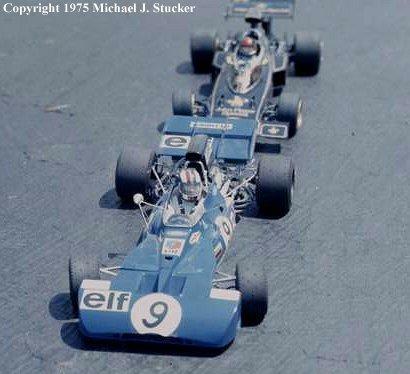 On the lower shelf is a Tamiya 1/12 scale Lola T70, three 1/43 scale Solido diecasts (Matra, Ferrari 312PB, & Ferrari 512M), 1/24 scale Porsche 911, 1/32 scale Matchbox Porsche 917, and 1/24 or 1/25 scale Ford GT40, 1970 Firebird Trans-Am, 1971 Penske Javelin, Porsche 911 speedster (which I made from a 911 coupe to match a custom car I saw in Road & Track magazine), Porsche 914, late ’50s T-Bird (in back), and a Camaro. 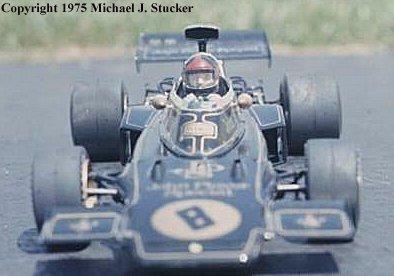 In this photo, on the top shelf are a Texaco/Marlboro McLaren M23, Lotus 72, Tyrrell, and Ferrari 312B. 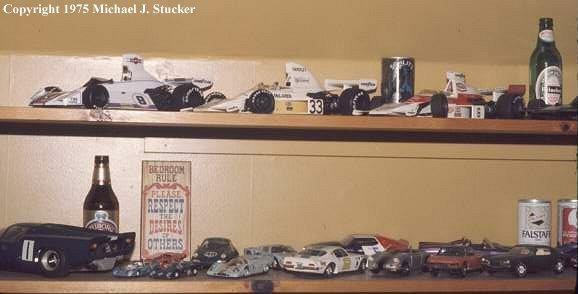 On the lower shelf, a Penske Javelin, Porsche 911 speedster, Porsche 914, Camaro, Pontiac Grand Prix, Chevy Vega, Ferrari GTO, Lincoln Continental, an unidentifiable white car, and a Dodge Charger funny car. Dodge Charger funny car. 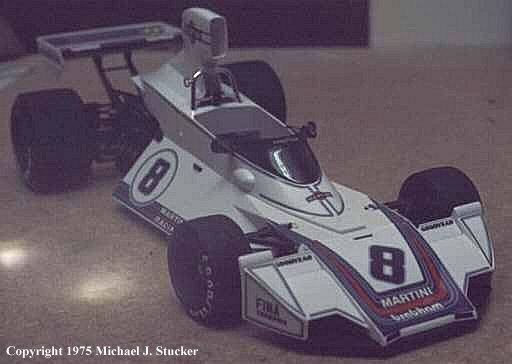 It was built from a kit of the Hawaiian funny car, but I converted it to rear-engined. When I went to the races in Watkins Glen, N.Y., for the first time, we came home via Scranton, Pennsylvania, the home of Auto World. For those of you who don’t remember or are too young to know, the annual Auto World catalog was the “Bible” of model cars. 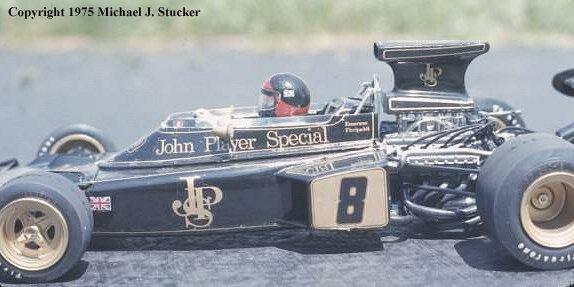 Kits, slot cars, diecasts, radio controlled — they sold it all. It was like a trip to Mecca for a model car builder to actually visit the Auto World store. 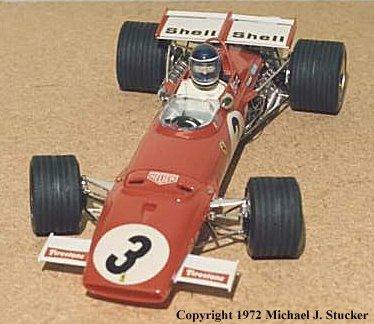 I bought my first 1/12 scale Tamiya model F1 car (Graham Hill’s Lotus 49B) on that trip. I would go on to build the first 12 in the series.